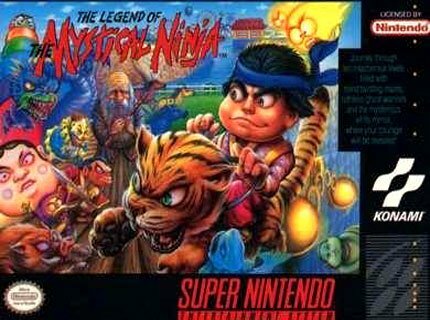 Legend of the Mystical Ninja for Super Nintendo has players slip into the role of Robin Hood figure Goemon and travel throughout ancient Japan in this comical action platformer with adventure elements. Explore towns, buy items and then jump head-on into graphically intense side-scrolling stages that make liberal use of the platform's trademark Mode 7 effects. One stage even has you turning the entire level upside down. The game also features a number of mini-games.